Jesse and friends are back for another adventure in the Minecraft world. 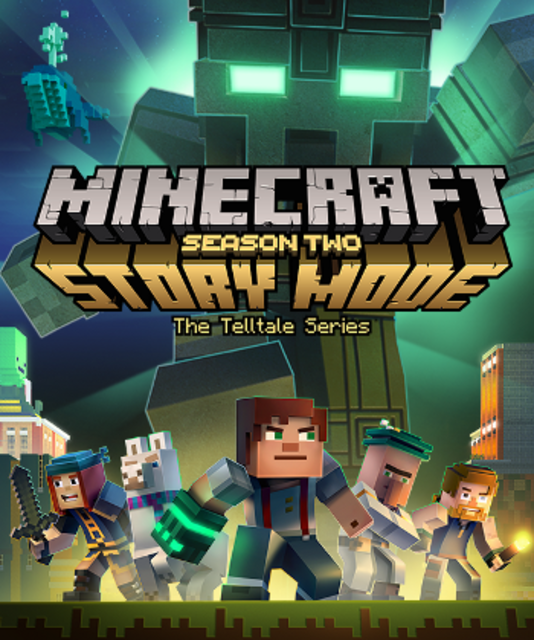 Minecraft: Story Mode - Season 2 is a five-part comedy-fantasy point-and-click adventure game developed and published digitally by Telltale (in conjunction with Mojang) for the Xbox One, PlayStation 4, Xbox 360, PC, and most iOS and Android devices. Episodes were periodically released between July 11, 2017 and December 19, 2017. The sequel to the original Minecraft: Story Mode (and the eleventh of Telltale's "tailored story" set of games), players continue the role of the customizable protagonist Jesse in a world inspired by Mojang's sandbox game Minecraft. After stopping the Wither Storm and becoming renowned heroes, Jesse and their friends are thrown into another adventure once Jesse's hand gets stuck in a mystical gauntlet belonging to an ancient underwater temple. The first two episodes of the game, along with a season pass for the remaining four episodes, ere bundled in retail form on the Xbox One, PlayStation 4, and Xbox 360 on September 19, 2017. It is the last of their "tailored story" games to be released on the X360 and is the last game released on Microsoft's "Xbox Live Arcade" channel. As old friends and new responsibilities pull Jesse in different directions, the discovery of a strange Prismarine Gauntlet leads him/her into a whole new world of mystery and danger. A powerful foe emerges in Beacontown and subjects Jesse to some bizarre (and deadly) challenges. Friendships will be tested and new alliances formed as Jesse fights to save the world from this mighty enemy. Jesse and the gang must brave a dangerous prison and its even more dangerous inmates to reach a secret at the prison's heart. But when the enemy tries to recruit Jesse's friends, will they all be able to resist the call? Our heroes take a journey to a long-forgotten land where nothing is quite what it seems and danger lurks around every corner. Will Jesse's new alliances and friendships withstand the tests they'll race? The final battle with Jesse's new enemy brings it home to Beacontown and the world may never be the same.